A full size dental implant is 3mm in diameter and is an ideal tooth restoration for people who are missing one or more teeth as a result of injury, periodontal disease, or any other reason. 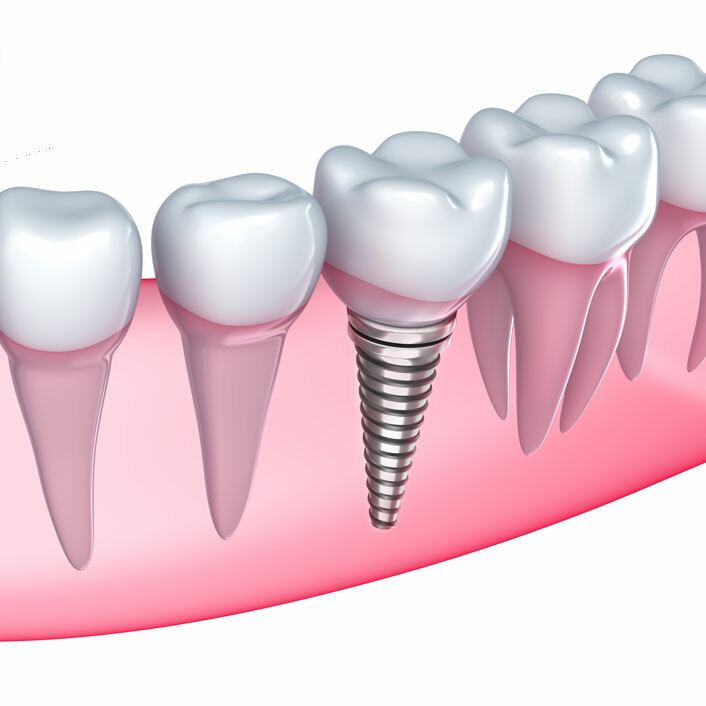 A dental implant is a metal post that a periodontist or oral surgeon surgically positions into the jaw. Once in place and the bone surrounding the implant has had time to heal, a replacement tooth is attached to the post. While implants are typically more expensive than other methods of tooth replacement, they provide superior benefits. Implants are stronger than natural teeth and generally last longer than bridge work. They are also a more favorable approach than bridgework since they do not depending on neighboring teeth for support. Mini implants are easier to place and also cost less than full size implants. Mini implants (1.8 to 2.9 mm in diameter) work best for replacing front teeth or bicuspid (non molar) teeth to support a crown. Four mini implants can also be used to support and stabilize a lower denture. This is now the standard of care and what I would want. Four small housings with O rings are placed on the small ball on top of the implant. Next the housings are bonded inside the denture base. Often implants and housings are completed the same appointment. If the bone is too soft for immediate loading the O rings are not placed in the denture. This allows the bone to adapt or integrate onto the implant for a few months before loading the implants. You will then enjoy a stable lower denture giving you confidence to smile, speak and eat. Dr. Garcia is a dedicated doctor who pays extraordinary attention to detail. He has completed advanced training in prosthetic implants in order to ensure that he will provide only the best results for you. Dr. Garcia also implements today’s best implant technologies in our office, solidifying our place as dental implant experts.